According to Gallup, as of June 2015, “the percentage of U.S. workers engaged in their jobs continued to hold steady at 31.9%,” which means that employee disengagement remains extremely high year after year. Do the math! Passive and active employee disengagement is costly business when you relate the stats to the 2015 total wages and salaries, which came out to about eight trillions of dollars. The problem won’t be fixed overnight, and organizations may want to realize that disengagement comes in a multitude of forms, and for a multitude of reasons. In many cases, however, it is linked to the “boreout” phenomenon described by Peter Werder and Philippe Rothlin in their 2007 book Boreout! : Overcoming Workplace Demotivation: employees are disillusioned, do not see the purpose of what they do or sometimes do not even know what they have to do – hence their self-preservation strategy of looking “busy” to keep their job. Before you try to revolutionize your processes at a global organizational level, start somewhere smaller after a careful analysis of the overall “health” of your company… Look at the new generation of products designed with the practical goal of engaging people in great achievement. One of them is Workboard, a well-funded company started in 2013 by Deidre Paknad. You establish the metrics that will enable your team to declare victory. You define the workstreams, i.e. the execution processes and all the dependencies that will support a particular goal. At all times, all the team members can see how fast they are advancing towards the goal, how well they are delivering on particular objectives along the way, and eventually the risks or blockages that call for specific attention. Education inequality is a chronic problem in this country, and it is getting worse. As a result, initiatives designed to assist are definitely worth special exposure. 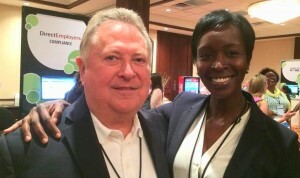 One of them is the DirectEmployers Foundation, Inc. headed by Simone Murray, its first Executive Director. Simone is passionate about her mission – and this, for very good reasons. Raised by a single mother who immigrated to the US from Jamaica when she was a child, she was the first and only one to attend college out of all of her six cousins that she grew up with. After completing college, her career in business management opened her eyes to the lack of diversity in roles with high paying jobs. “I knew once I reached a certain level of success,” Simone says, “that I wanted to open the doors for my children and other students”. Scalability: Traditional internships target students individually. In this new model one company addresses several students at once. Employers come to a school and set up their business environment within that school. They are “employers-in-residence” and they conduct their work activities in a dedicated area on a school campus. Typically, each group comprises six to twelve students in grades 8-12. In 2015, the initiative has impacted over 165 students from ten schools. Two of these schools have hosted the Employer Simulated Workplace labs, IPS Career Technology Center and Bloomfield Jr./Sr. High School. Some of the employers who have participated so far include the DirectEmployers Association, Salesforce, Duke Realty, NSWC Crane, PwC, Eli Lilly and Company. Effective learning for students: Individual internships transplant students into an unfamiliar place: the more socioeconomically disadvantaged a student is, the higher the culture shock. More often than not, efforts to adjust to a completely foreign environment create fear or discouragement, a severe form of distraction that prevents interns from enjoying the experience and, even worse, from leveraging their own learning potential. They spend too much time struggling with the inhibiting emotions of their fear of not fitting in. 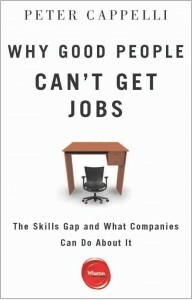 In this new model, companies immerse themselves into the students’ environment, and, as a result, students can directly share their experience with their peers in their own language as well as with their teachers, who, in turn, can enrich their courses, because they too are seamlessly exposed to the corporate world. The DirectEmployers Foundation, Inc. is a powerful, transformative initiative fostering new mindsets and new hopes among disadvantaged adolescents. As Bill Warren, Executive Director of the DirectEmployers Association, puts it: “By providing opportunities for our employer partners to show at-risk students what it’s really like to work day-to-day in a STEM career, we believe that those students will pursue such a major in college and eventually work for a local STEM employer, earning high wages in high skill jobs.” The initiative is also an occasion for companies to meaningfully connect with complex urban groups whose sole exposure to the business world consists of seeing gigantic illuminated logos from their suburbs. Companies should consider participating to the DirectEmployers Foundation as a major action item in their inclusion and diversity programs and help the DirectEmployers Association to extend it to multiple States. Reducing education inequality has always been about inclusion and desegregation. Are you willing to cheat because you have reasons to believe that it’s what it takes to be in your superior’s good books? Where will you draw the line? Are you also going to lie about product development strategy, sales or accounting because he/she could be upset if things don’t go as well as he/she would like? Do you want to be part of a misleading culture in which your boss will provide, willingly or not, false information to his/her own boss and ultimately to the shareholders? Do you want to be caught in the spiral of potentially shady activities? If you have doubts about the ethics of your bosses or the quality of the corporate culture that they embody, leave before they neutralize you, destroy you or make sure that they fire you for not tagging along (and, if you can afford it, do not ask for a separation agreement). What’s going to happen if you cheat and your boss finds out that you did? If your boss is unethical, he/she may not like the fact that you know it and interact with him/her based on that premise. It’s not uncommon for unscrupulous people to extoll their respectability, care for their reputation… and resent that you have seen through them. Many bosses want you to tell them what they want to hear or see what they want to see, but they expect you to do this “unbeknownst” to them in order to make you the fall guy if anything goes wrong. No matter what you do, you will be part of his/her hit list anyway. If your boss is ethical, he/she will be horrified. If you make them win no matter what, how can they trust you when you report on the state of the business? How can they know that you are not ready to cheat for your own aggrandizement? This boss should sack you immediately. Diateino just published the French translation of The Age of Context by Robert Scoble and Shel Israel: L’Ere du Contexte. Here below is the English version of the preface I wrote for the French audience. When we speak about the “context” of a phrase or an event, we allude to the circumstances and conditions that give that phrase or event its particular meaning, or import. The “context,” then, acting as a backdrop, allows us to understand, to explain, or to justify the things we encounter through resonance to particular times and/or places. Everything that we say and do is inscribed in an environment we cannot always control, and upon which we are dependent. In The Age of Context, Shel Israel and Robert Scoble extend and, in some ways, invert the idea of context. Although we are the children of our time, acting and thinking within the spatial and locational framework given us, we are more than the simple products of a context; we are also its creators, by the choices we make and the use of our free will. These days, new technologies offer so many possibilities that we have, more than ever, the ability to become architects of our own contexts. Robert Scoble and Shel Israel share with us their enthusiasm for human connection through examples from their world, primarily in the United States. But the context age is spreading at more or less the same rate everywhere in the world, and thousands of entrepreneurs are rivaling one another with their ingenuity and creativity. Some are taking on enormous infrastructure problems, such as the Toulouse start-up SIGFOX, which offers a global network powering the Internet of Things that consume little energy and is inexpensive: “I have brought back a taste for low-cost technology that was used by submarines in World War I, the Ultra Narrow Band, which was used to transmit signals in Morse code,” recalls not without humor the company’s founder, Ludovic Le Moan. “With this technology, we deal with very weak signals in the midst of enormous ambient noise.” At the same time, other entrepreneurs merge design and technology with rare elegance, such as, for instance, Netatmo: its smartphone thermostat, designed by Phillipe Starck, allows you to remotely control your heating system while it remembers your habits to adjust the temperature in real time. June, conceived by Camille Toupet, meanwhile, is a splendid piece of jewelry that measures solar exposure and advises women on how best to protect themselves from the sun’s effects. Google is testing a prototype for contact lenses that would help diabetics measure glucose levels in their eyes. Samsung, teaming up with San Francisco University, has opened a lab to develop data sensors to allow digital health regulation. The Age of Context is not about the magical era of automatons functioning according to predetermined programs; these days, sensors allow objects to receive and analyze data in order to adapt appropriately to varied environments and consumers without any particular technical knowledge. These objects are more or less complex, but they are usually very simple to use, whether we are talking about the Kolibree toothbrush, which remembers your brushing habits and identify areas that you are brushing incorrectly, or about the Flower Parrot, which helps you optimally take care of your plants. The Age of Context is a revolution in our daily lives that touches jewelry, electric mowers, cars, drones, or small communication devices such as the Wi-Fi-enabled Nabaztag, which has engendered several next generations since 2005 and whose creator, Rafi Haladjian, has been on a mission “to develop systems that are really intelligent and that allow for the creation of new services in all areas of life.” The smart home is no longer a concept but a reality that is growing and being refined quickly with fascinating incarnations, as the Commission for Energy Regulation (Commission de régulation de l’énergie) reminds us in its survey of communicating house projects and intelligent buildings worldwide: “Eco-efficiency in terms of energy, with intelligence loaded into a habitat and its equipment, is now recognized as a priority by policies and institutions.” This involves numerous economic players, whether they be of the old or new guard: makers of household appliances, producers of electric heating, agents of worldwide telecommunication and internet, building companies, the automobile industry… In this vein, the report adds, “Toyota is developing in Japan, in the village of Rokkasho, a smart housing project, the Toyota Smart Center, in which the automobile manufacturer has established two smart homes equipped with a house system for energy management, with six electric vehicles, rechargeable Prius hybrids.” Naturally, Honda has elected to do something similar in California, where the cars and houses will all be part of a Smart Grid, “smart” electricity distribution network. Of course, I was thrilled to hear that Mary Barra will be the new CEO of GM. The appointment of any woman at the head of a company is a victory for all women. The value of being able to keep talented interns. The power of internal mobility: Mary Barra was involved over the years with virtually every aspect of the business. The power of an being outstanding VP of GM’s human resources department, a position that she occupied between 2009 and 2011. She is credited with making the culture of the company evolve. APE, Author, Publisher, Entrepreneur by Guy Kawasaki and Shawn Welch is an absolute must-read for anyone who wants to write a book and self-publish. It’s packed with information, advice, tips and resources. Even if you still dream of finding the ideal agent and the most prestigious publisher on the planet, chances are that you will be ignored. So don’t waste your time: take your fate into your own hands and go for self-publishing. This book tells you how to make it right. 1) You want to become an author for the right reason — be of interest to real readers out in the wild (and not just to please yourself or your friends). 2) You understand that the self-publishing revolution is only starting: “only about 10% of publishing revenue comes from ebooks.” But that shouldn’t detract you, especially if you don’t stand a chance contributing to the 90% of the print books of the US publishing industry. Think of the opportunity: you are part of a new movement. So start… Use the right tools. Read this book starting from page 1. Get Word. Create your template or leverage the work of others, such as Guy’s APE or Adam Shepherd’s Perfect Pages: Self Publishing with Microsoft Word. Don’t waste time doubting yourself and turn into a daring entrepreneur. Is it possible? Yes. Start now! Finance your book. You are not paid to write your book and it’s going to cost you some money. Not a fortune, but as in any business, check what you are ready to spend based on how many books you might be able to sell. Leverage existing organizations such as the Independent Book Publishers Association or crowdfund your efforts using Indiegogo, Unbound, Pubslush, or Kickstarter. 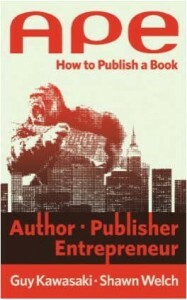 Self-publishing is business with real upside potential. Yet, do not underestimate your costs and price your book accordingly — albeit reasonably. Think “Distribution:” The self-publishing ecosystem is fragmented and messy. Just as any entrepreneur, analyze what it is about and choose your distribution channel (eBook resellers or direct) based on your goals. Take some time to learn from others. The simplest path is Kindle Direct Publishing, but also look into Apple, Barnes & Noble, Google, and Kobo; compare, and still consider selling directly to readers! Remember also that self-publishing doesn’t prevent you from using Print-on- Demand companies for printed versions. An important detail: Every format of a book needs a unique ISBN (although all ebook platforms count as one format). Like Guy’s first book, The Macintosh Way, of which I had the privilege of being one of the very first readers, this book “celebrates passion, competition, excellence, and hard work. The basic premise is that David can defeat Goliath, that a teenager can fly into Red Square, and that an ex-jewelry schlepper from Hawaii can eat pate with a French philosopher at Jacques Cagna in Paris.” Become a self-published author the “Macintosh Way,” which entails “doing the right thing and doing things right,” and “competing on execution.” Become part of the APEcommunity: join the movement on Google+. One Million by One Million (1M/1M) celebrated it’s 150th free and online roundtable mentoring session for entrepreneurs a few days ago, and announced its 2013 New Year Challenge. The New Year Challenge will award twelve scholarships worth $1,000 each to twelve entrepreneurs. This scholarship allows entrepreneurs to join the 1M/1M premium program that offers private roundtable sessions, a comprehensive curriculum, and introductions to potential customers, channel partners, media, analysts, and investors. Complete the application process here by December 20. Get at least 50 of your Facebook friends to vote for you here by January 3, 2013 to qualify for the final round. 20 finalists will be chosen by audience voting, so get AS MANY of your Facebook friends to vote for you as you can to maximize your chance to win. Twenty entrepreneurs will be selected to pitch their startup during the finals on January 10 and January 17, 2013 by audience voting. The 20 Finalists will be notified by January 7, 2013, and instructed on preparing their presentations for the January 10 and 17 finals. The finals will be held during the 1M/1M roundtables, and you can register to attend here. Twelve entrepreneurs will win the prizes! Go for it! 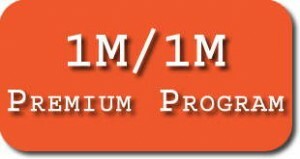 To know more about the program: One Million by One Million (1M/1M). I also wrote a post a while back about this amazing — and highly successful — initiative started by Sramana Mitra to democratize entrepreneurship education. Today, over 50,000 people participate in the 1M/1M community. Several revenue-generating companies have been incubated in the program, some have received angel and/or VC funding, and some have crossed the $1M mark. You can listen to some of them in the recording of the 150th roundtable on YouTube. I met Lynette Young at Guy Kawasaki’s party at SXSW earlier this year. She contributed to one of the chapters of Guy’s landmark book, What the Plus! : Google+ for the Rest of Us. No wonder, Lynette represents the elite of “female googlers,” with over 1.5M followers. Lynette just released an excellent short book. 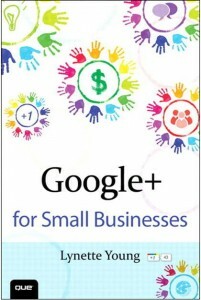 Google+ for Small Businesses. Her goal is to help you to realize that “Google + makes it easy for the small business owner with limited resources to be on an “even playing ground” with large corporations that have seemingly unlimited budgets.” Google + is more than a social media network: it’s the platform by the online search and advertising giant that owns the two most used search engines in the world, Google and YouTube. So visibility for your small company is at your fingertip. On Google+, just as any social platform, you must be genuine, show that you care for others by sharing their content, and offer meaningful content of your own adapted to your various targets. For example, don’t bombard your VIP circle with tips that only matter to your current customers. With minimal, but consistent efforts, your Google+ Page will operate as an important amplifier for your small business. So keep in mind that a social platform basically follows the same etiquette as the physical world. If you are nasty, your nastiness will come across as even more ridiculous than it is. If you are great, your greatness, too, will be magnified.